Home / Columnists/ Should weak financial institutions be allowed to exit? Should weak financial institutions be allowed to exit? Recently there were protests by depositors of several distressed finance companies in the country. Angry protesters gathered in front of the relevant entities and Government buildings, demanding redress. 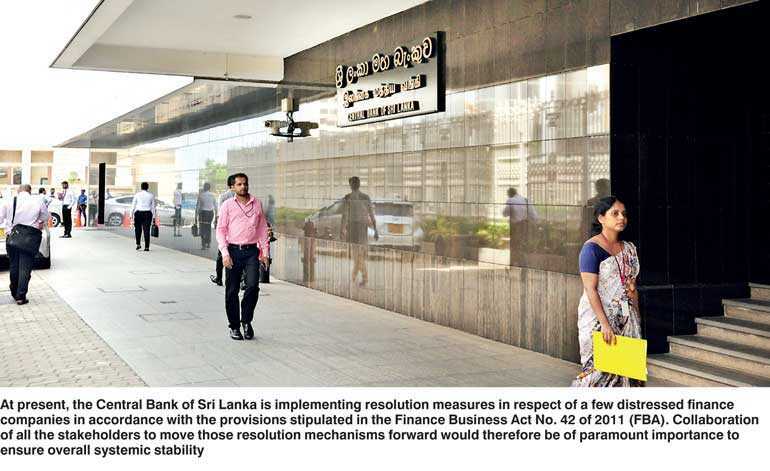 The Central Bank of Sri Lanka (CBSL) meanwhile has set out the regulatory measures that are underway to resolve the distressed institutions thereby to ensuring financial system resilience. Failures of financial institutions can create negative externalities that reduce economic growth. The abovementioned protests also demonstrate the social cost of financial system instability. There is evidence from around the world that cost of failures of financial institutions has been severe over centuries. Thomas Jefferson is said to have commented that “banking establishments are more dangerous than standing armies”. Financial system stability has come to forefront to dominate the business and economic agenda over the past few years after the global financial crisis. During the global turmoil, financial giants like AIG, Freddie Mac, Fannie Mae, IndyMac, Lehman Brothers and several other institutions in the UK, Europe and emerging economies collapsed, destabilising the whole system. However, even in the developed jurisdictions there were no proper resolution frameworks in place to allow orderly exit of failed entities. More complex problems emerged in relation to resolution of cross-border financial institutions and groups, the so-called “too big to fail” banks. In the absence of a robust resolution framework, bail out cost incurred by the tax payers increased. That situation created a moral hazard and had an adverse impact on the effectiveness of the risk mitigation frameworks of financial institutions. Until very recently there had been no cohesive policy mechanism to eliminate failing financial institutions in Sri Lanka. This article will therefore discus the ‘Special Resolution Regimes’ introduced to the international regulatory arena in the aftermath of the financial crisis; and also focus on sharing the developments related to the resolution regime in Sri Lanka, with stakeholders of the financial sector and the general public. Since recurrent collapses have been reported in the non-bank sector, the main focus will be on the regulatory framework for finance companies. Resolution is the restructuring of a financial institution by a resolution authority through the use of resolution tools in order to safeguard public interests, including the continuity of the institution’s critical functions, maintain financial stability, and minimise costs to taxpayers. The Monetary Law Act, the Finance Business Act and the Companies Act provide for resolution measures for distressed financial institutions in Sri Lanka. Episodes of distressed finance companies in Sri Lanka and other countries have demonstrated that notwithstanding stringent regulatory reforms, failures do occur. Various economic crimes, including mortgage fraud, predatory lending, Ponzi fraud schemes, market misconduct, market manipulation and various other serious financial irregularities have caused failures of banks and finance companies in Sri Lanka. Investigations conducted subsequent to such collapses have revealed that poor corporate governance structures and weak compliance systems have created platforms for such economic crimes. Adam Smith also accepted that regulating banking is necessary to safeguard the common good. Hence, a robust regulatory system that enables taking prompt corrective actions in the event of crises is vital for systemic resilience. When management and employees of financial institutions collude for fraudulent transactions and malpractices, regulators face challenges in detecting such offences. In finance, where information asymmetry prevails the social value of private action depends not only on formal adherence to the laws but also on ethical behaviour by market participants. Since finance business is inherently risky, failures will be inevitable. Financial institutions can fail due to genuine commercial reasons rather than fraud and/ or misconduct. The adverse impact of the sharp decline in the gold price on some of the finance companies in Sri Lanka during 2011/2012 is an example of this. A robust time tested mechanism, is therefore, needed to deal with such failures without resorting to public funds while preserving vital economic functions. Why have a special resolution regime for financial institutions? In addition to acting as monetary policy transmitters, financial institutions play a pivotal role in the economy as credit intermediaries. Inherent fragility of financial institutions requires special regulatory attention. Failures of financial institutions can reduce liquidity thereby disrupting borrowers’ access to credit. Financial institutions remain the primary source of liquidity for most financial and non-financial undertakings. Sound financial intermediation is also necessary for efficient resource allocation that promotes growth and employment. Special resolution regimes are, therefore, important to ensure continuous provision of the financial intermediary function which is vital for the efficient performance of the macro economy. The lack of a carefully-drafted plan for failing institutions to exit the market will lead to uncertainty and disruption in the system. There should be a fast and decisive procedure to deal with problem entities. Andrew Bailey (2009) stated that: “The guiding principle should be that by no later than first thing on Monday morning we must be able to tell depositors that their money is safe.” Resolution of Lehman Brothers and AIG are examples of the adverse impact of a disorderly process which triggered systemic instability and a high cost to tax payers. Measures had been taken to place the management of the finance companies which failed during 1991-2005 in Committees appointed by the CBSL and to vest such companies in the CBSL. Such measures had been taken when those companies were already insolvent. Measures should, therefore, be available to assist a company when it has sufficient equity but experiencing temporary difficulties in liquidity. However, distinguishing between illiquidity and insolvency is a difficult task for the regulator in today’s complex business context. It has also been reported that various other measures, such as converting deposits into shares, etc., adopted to deal with the companies which collapsed during 2008-2009 lack the elements required for a cohesive framework for rehabilitating financial institutions in distress. At present, CBSL is implementing resolution measures in respect of a few distressed finance companies in accordance with the provisions stipulated in the Finance Business Act No. 42 of 2011 (FBA). Collaboration of all the stakeholders to move those resolution mechanisms forward would therefore be of paramount importance to ensure overall systemic stability. When public funds are used to bail out failing financial institutions, moral hazard can compromise discipline and self-governance of such entities. However, regulatory authorities will need different resolution tools to address different types of financial institutions. That means having a rich set of tools but with a common trigger for proactive resolution which facilitates a much more practical and effective way forward. In financial regulation, taking timely action is crucial. Expert opinion is that the best moment for an entity to go into resolution is when all recovery strategies are exhausted. Some scholars argue that a sensible trigger for resolution would be when a financial institution no longer meets the criteria for being licensed and crucially, when there is no reasonable prospect of its doing so again. The Financial System Stability Board (FSB) developed the key attributes of effective resolution regimes for financial institutions and this was approved by G20 leaders in 2011. One such key recommendation of FSB is that an effective resolution regime should provide for the timely and early entry into resolution before a financial institution is balance sheet insolvent and all equity has been fully wiped out. In terms of Section 31 of the FBA, which is the main governing law of licensed finance companies, if a finance company is insolvent or is likely to become unable to meet the demands of its depositors or that its continuance in business is likely to involve loss to depositors and other creditors, measures can be taken to suspend the business of such a company. Taking over administration and management of an ailing company, and vesting the business with another entity, are other resolution actions stipulated in the FBA, and which are being invoked by the CBSL at present. These provisions enable the regulatory authority to take prompt corrective actions and explore the possibility of stabilising the failing company. In Sri Lanka, depositors and other stakeholders of financial institutions are not familiar with such resolution measures, including liquidation of failed financial institutions. When the regulators attempt to revive a failed institution by bringing new investment, depositors tend to protest against the delays. However, such resolution processes are time consuming and prolonged procedures may wrongly be seen as regulatory forbearance. It is important, therefore, that good communication channels which engage all stakeholders, especially the depositors, are part of the resolution toolkit. Triggers for resolution measures can be categorised as quantitative and qualitative triggers. Deterioration of capital, liquidity, asset quality, earnings, and profitability, credit risk and return on assets, etc. can be considered as quantitative triggers. Among the qualitative triggers, weak risk management, lost confidence of depositors, deficient management and defective business environment are key indicators. If acting upon those triggers are not mandatory, there is a flexibility for discretionary responses. However, mandatory triggers would prevent regulatory forbearance. Such regulatory measures will also send a strong signal to the financial system and may reduce legal challenges. Depositors and other stake holders of failing companies are asked to bear losses in executing resolution measures. However, the boards of directors and the management should also bear the burden and pain if they have acted in contravention of applicable laws. According to the Financial Stability Board, claims and litigation advanced by the failed bank or the receiver/liquidator against directors, officers, auditors and other parties related to the bank failure are potentially important assets. Effective legal action of different types against persons at fault in the failure of financial institutions will help to improve market discipline and ensure the recovers of embezzled funds. Assistance of the law enforcement authorities for the resolution authority’s in taking actions against misappropriation of public funds is therefore important. Section 51 of the FBA provides for such measures against unlawful gains to anybody and losses to the company due to action or omission of directors or managers. Recovery of embezzled funds will reduce the burden on the Deposit Insurance Scheme. Which entities should come under Special Resolution Regime? Any financial institution “which could be systemically significant or critical if it fails” should be within scope of an effective resolution regime. This will ensure that all systemically important institutions will be within an appropriate framework to exit from the system in the event of a distressed situation without causing strains to public funds. If country specific circumstances are considered, it can be argued that bringing all the deposit taking financial institutions (banks and licensed finance companies), irrespective of their size and systemic importance, under an appropriate resolution framework is important. Recurrent failures of small finance companies in Sri Lanka have served to erode the public trust in the country’s financial system. During 2008-2009, a number of small companies failed due to the collapse of a financial conglomerate in Sri Lanka. It proved that widespread failure of small entities can have destabilising effects on the economy. In the context of Sri Lanka’s experience and circumstance, it can be suggested that a special resolution regime based on international standards be implemented in a manner that is proportionate to the structure and complexity of the country’s financial system. Various policy measures initiated, such as Financial Asset Management Authority and Cabinet Committees, have not been fruitful. The establishment of the new Resolution and Enforcement Department of the CBSL can be considered as a welcome approach towards the goal of an effective special resolution regime for the country. FSB recommends that each jurisdiction should have a designated administrative authority responsible for exercising resolution power over firms within the scope of the resolution regime. However, it needs to be emphasised that in the event of there being multiple authorities the respective mandates, roles and responsibilities should be clearly defined and coordinated. Operational independence, transparent processes, sound governance and adequate resources are other significant factors necessary to make the resolution effective. Politically-motivated interventions would otherwise defeat the objective of special resolution. The Financial Institutions (Resolution) Ordinance issued by the Hong Kong Monetary Authority has made the Authority subject to a rigorous evaluation and accountability mechanism to assess the effectiveness of its resolution measures. To make resolution effective, the relevant entity should have a broad range of powers at their disposal. These powers mainly include “Conservatorship” i.e. remove and replace the senior managers and board of directors of the affected firm and appoint an administrator to take control of and manage the firm. Purchase and assumption is a resolution tool that allows for the transfer of a troubled entity’s operations to another healthy institution. Power to establish one or more “bridge institutions” to take over and continue operating certain critical functions and viable operations of a failed firm is also a widely used tool. In some jurisdictions, “Nationalisation” occurs when the Government assumes ownership of an institution. A key characteristic of these tools is the power to override rights of shareholders of the firm in resolution and unilaterally restrict the debt of a financial institution through “bail in”. In terms of the provisions of the FBA, the CBSL (Monetary Board) is empowered to review any agreement entered into by the finance company (including with depositors) and vary the terms of such agreements/contracts. Awareness of depositors and other stakeholders regarding these resolution tools will be helpful in implementing such measures efficiently and effectively. Cooperation of all stakeholders will facilitate expeditious implementation of resolution measures. In Sri Lanka, it has been observed that sometimes depositors urge the regulator to expedite recovery plans. However, prior to granting approval for investment in a regulated entity, there is a requirement to examine the credentials of potential investors, source of funds, availability of funds and the viability of the proposed business plan, to ensure effectiveness of the stabilisation measures. Another concern stakeholders of Sri Lankan financial entities have in relation to the liquidation procedure is the time taken to complete the liquidation process. Unlike in other jurisdictions, Sri Lanka does not have a special winding up procedure applicable for financial institutions. General insolvency law focuses on maximising value for creditors and does not allow financial stability concerns to be taken into account. Long duration of insolvency proceedings may hamper the critical functions such as payment services and trade finance. There is a strong case to have a special winding up procedure for financial institutions to uphold public confidence in the financial system and maintain systemic stability. It should be noted that, the FBA provides for making regulations with regard to the priority of claims in a winding up of a finance company. In some countries, a special fund for resolution of financial institutions has been established to finance the compulsory wind-up measures imposed by regulatory authorities. Such funds are financed by contributions from relevant financial institutions in the country. The Monetary Authority of Singapore has established such a Fund to ensure timely and adequate funding for the implementation of resolution measures. After the global financial crisis, most of the developed jurisdictions have required their financial institutions to prepare “resolution plans” or “Living Wills”, which would guide regulators through the process of liquidating an entity without disrupting the entire financial system. These “Living Wills” contain two tiers. The first tier is “recovery” or a plan for restoring the financial institution to health and stability, if possible. Resolution is the second phase. It requires to setting out of a mechanism for orderly failure through sale, divestiture or other means. Though financial institutions complain that preparing a “Living Will” as a costly exercise, it would be an opportunity to take a comprehensive look at the entity’s strategy and risk profile. This will compel the board of directors and the management of the relevant entity to determine the institution’s long-term direction. According to Goodhart (2011), the main purpose of “Living Wills” is to achieve ex-ante benefits. The drawing up of a “Living Will” should focus the minds of the institution’s management and of the supervisors as to what they should expect in the event of an institution’s failure. It is worthy of consideration whether all regulated financial institutions irrespective of size (i.e. systemically important or not), should have a “Living Will”. The “Living Will” can be submitted to the regulator as a financial institution’s key document on business and capital strategy. It is important to maintain a tight connection between “Living Wills” and the financial entity’s overall strategy for profitable growth. Though there are arguments against this famous aphorism, it will be important to develop legal frameworks that can facilitate effective cross border resolution particularly if a country has the ambition to become an international financial centre. Developed jurisdictions such as Canada, Japan, Germany, Denmark and the USA have introduced special resolution regimes. EU too has developed a common mechanism to allow distressed financial institutions to exit without having an adverse impact on the systemic stability. In the EU, under the Bank Recovery and Resolution Directive on crisis prevention, management and resolution the European Banking Authority is mandated to develop a consistent resolution procedure across the Union. Prior to the financial crisis, the UK didn’t have a permanent statutory regime to deal effectively with failing banks. The Banking Act (Special Provisions) 2009 of the UK was enacted in order to facilitate an orderly resolution to maintain financial stability and protect the public interest. No financial system can expect a scenario of “zero failure” of financial institutions. However, all the stakeholders should be well-equipped to prevent a major shock in the system. The impact of failures of financial institutions on the real economy and public budget can be reduced through stringent supervision and regulation coupled with robust recovery and resolution planning. Such resolution approaches need to be dynamic and forward looking in the context of next wave of technology innovation. Boards of directors and management of the financial institutions must attach priority to ensure a more accountable and consumer focused financial system which can provide an efficient service to the public and the economy. In the absence of integrity and sound corporate governance frameworks in financial institutions, imposing rules and regulations will not deliver the desired results. “Integrity has no need for rules” – Albert Camus.